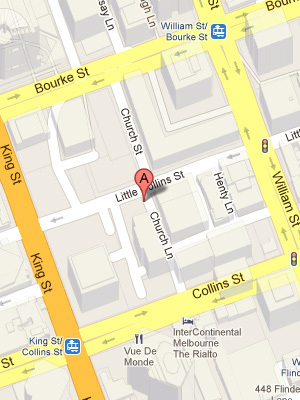 I was recently invited along to a media and blogger dinner at the new-ish Paul Mathis establishment in Melbourne CBD. Paul Mathis has been a busy bee, opening up 6 new dining places in the last 6 months (two of which I’ve been to, The Sharing House and Akachochin). 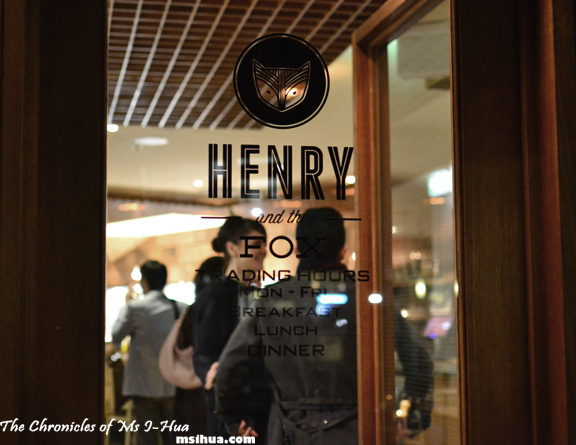 The name “Henry & The Fox” was not named just after the famed children’s story as most would conclude, but rather, after Paul’s PA and the head chef running this restaurant as well. Henry is the last name of Paul’s PA and Fox belongs to Michael Fox’s last name, The Age Good Food Guide’s Young Chef of the year for 2011. With all that in mind, my expectations as I arrived were definitely very high. Tucked away at the back of 500 Collins Street (or the Saxons Training facility), lies this Fantastic Mr. Fox (see what I did there?) establishment. Getting there wasn’t too difficult for me, as I work at that end of town, but if you are thinking of driving, parking can be quite a bummer. My advice would be to take public transport, it’s much easier and more affordable, a better option if you were thinking of having a few drinks as well. The decor at this place is modern and chic, with wide open spaces and large paneled glass windows for natural lighting. It is located at a very quiet end of Melbourne CBD, so I’m hoping business picks up for it, as the food was generally good and the environment very pleasant. As we walked through the doors of the establishment, sommelier Sophie Johnston greeted us with smiles and a glass of bubbles. 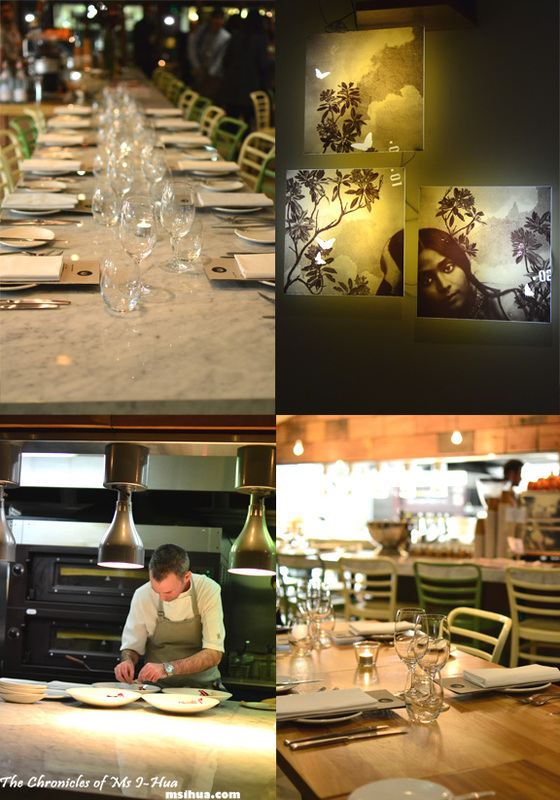 We could see Michael busily plating up in the open planned kitchen as well. 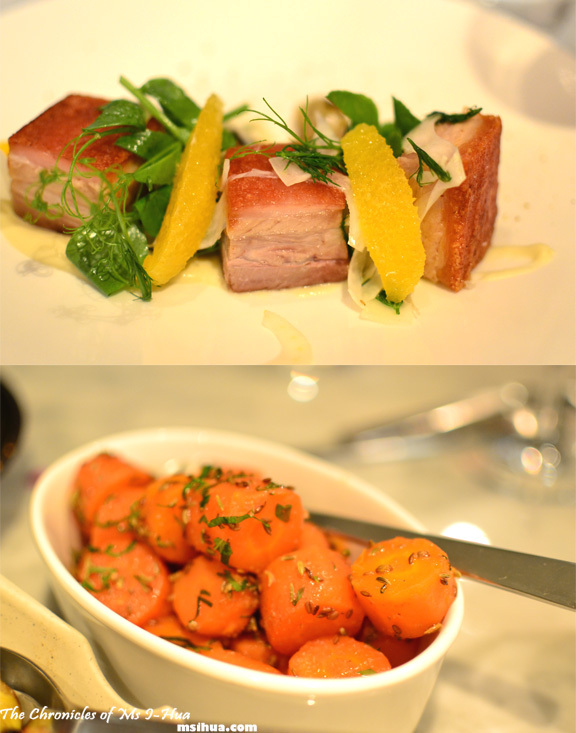 For entrees, we were spoilt for choice with the sharing plates that were flying out of the kitchen. 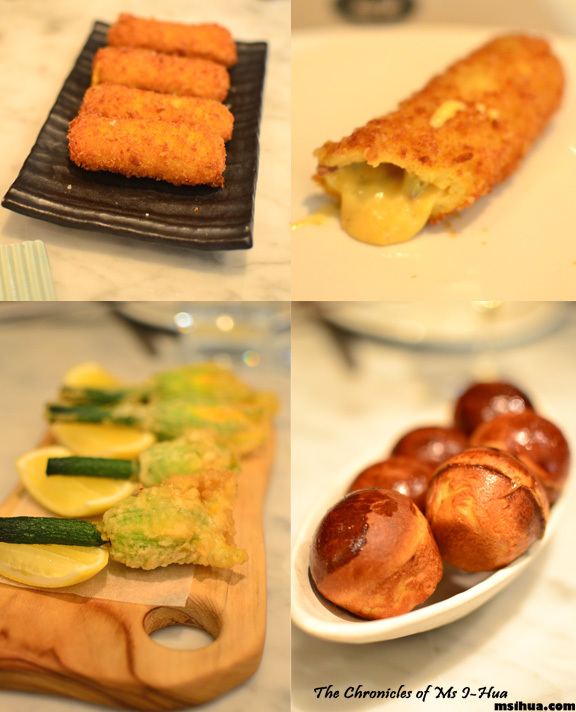 The croquettes were one of my favourites. It was crumbed beautifully with the cheese oozing out of the encased shell. So good. The zucchini flowers, when cut open revealed ricotta cheese, peas and fresh mint. 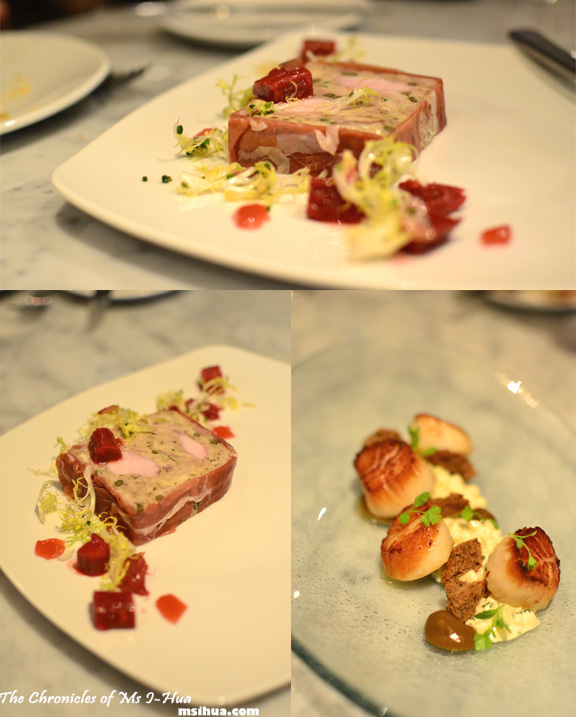 The little cute brioche balls you see pictured (above) at the bottom left, was to go with the Rabbit Terrine pictured below. It was soft, fluffy and pillowy. The terrine wrapped in jamon was a thing of beauty. I’ve always wanted to make a terrine, but it requires far too much effort and patience which I do not have. The scallops arrived with homemade pumpernickel and I particularly liked the interplay of textures between the puree and remoulade. One of the most unique dishes (to me) was the way the goats cheese was presented, in meringue forms. It was just too cool and had me planning my next dinner party immediately with thoughts of all food items I could turn into meringues to trick my guests! I was quite intrigued with the combination of the ingredients that came with the cured kingfish. It was a bit Middle Eastern and a bit Asian, but with a western take on it, leaving my palate a tad confused. The bug was beautifully cooked, but was let down with the over-seasoned cauliflower pureé and I found it a bit too salty for my taste. But I do find a lot of things very salty these days as I’ve all but wiped out salt from my cooking (or to a very minimal level)! 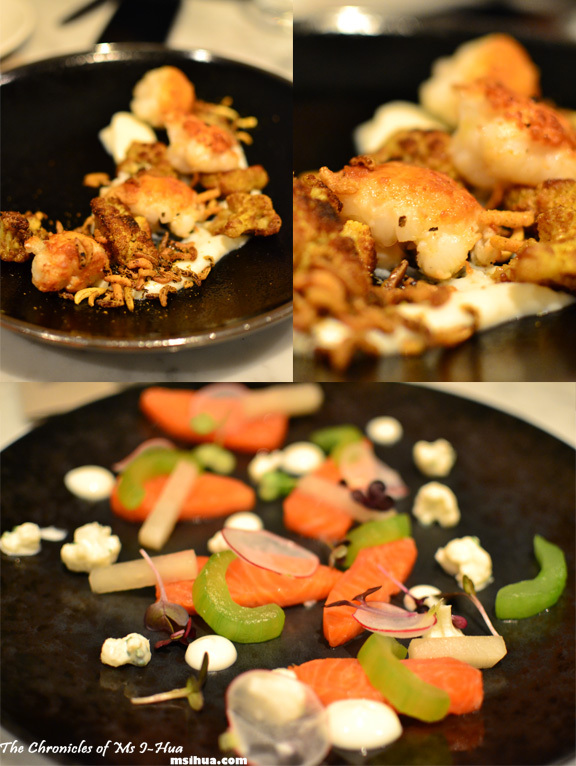 The ocean trout however, was beautiful and I couldn’t help but compare it to the gravlax dish at The Sharing House. 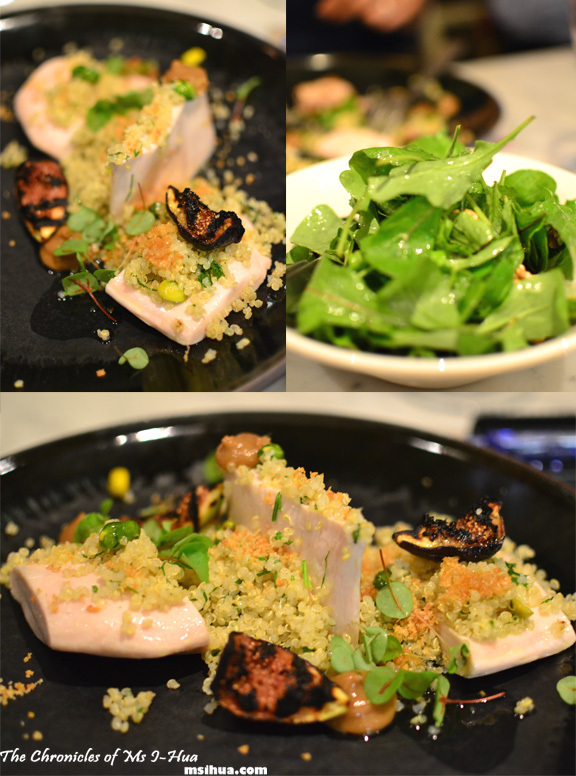 The poached chicken was cooked beautifully, maintaining a tender and juicy flesh. However, it was after all only poached chicken and I didn’t find it too exciting. But all was not lost with the mains, as I tried some of Allan’s fish. Heck, I all but swiped the fish out of his plate to replace with my chicken *ninja skills*. The fish was cooked brilliantly and was so well marinated it didn’t really need any other flavours to go along with it. It’s a winner for me. Then, it came time for desserts! What? You didn’t think we have had enough to eat yet, did you? 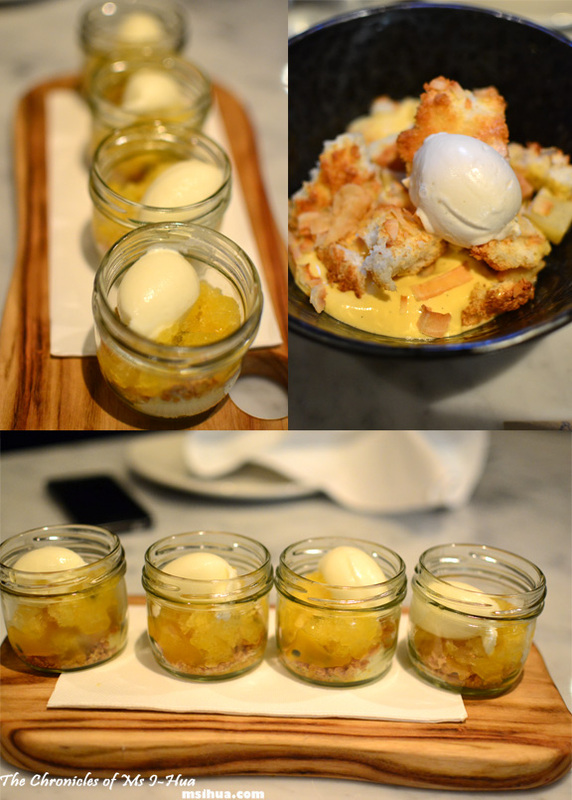 My favourite dessert of the night (and dish) hands down went to the delicious deconstructed passionfruit cheesecake in a jar. I am not usually a fan of cheesecakes (too rich) or passionfruits (too many seeds) in general, but I couldn’t get enough of this dessert. Everything yelled “Delicious“, the flavours were very well balanced and thought of. The custard dessert didn’t excite me as such, but certainly got Bryan ooh-ing and ahh-ing with every spoonful (to each its own!). I was hoping that there would be some chocolate desserts to end the night with a bang. I even lamented sadly to the staff, “Oh, let there be chocolate!” but they played coy with me and indicated that it wasn’t going to be my lucky night. Ooooh the sly foxes, didn’t they grin in delight as I squealed in excitement when not one, but two chocolate desserts appeared in front of me! 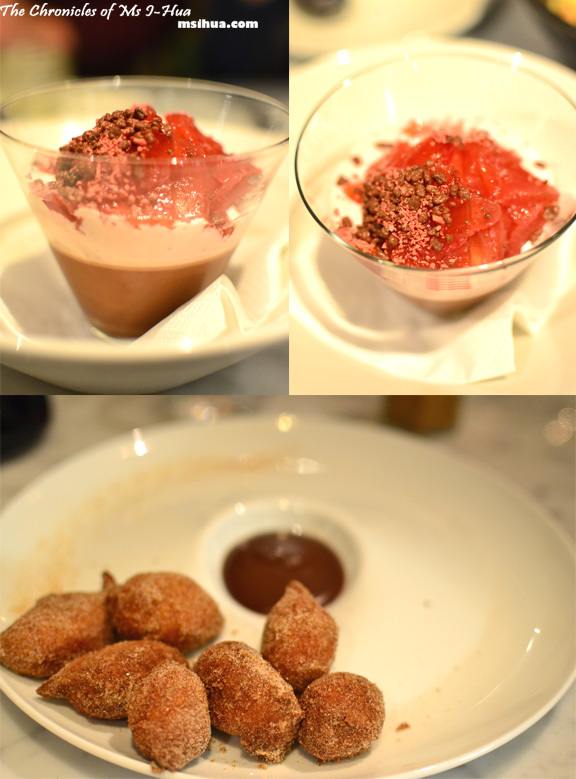 Despite the rather lacklustre main dishes, Henry & the Fox came out with flying colours with the entreés and desserts. 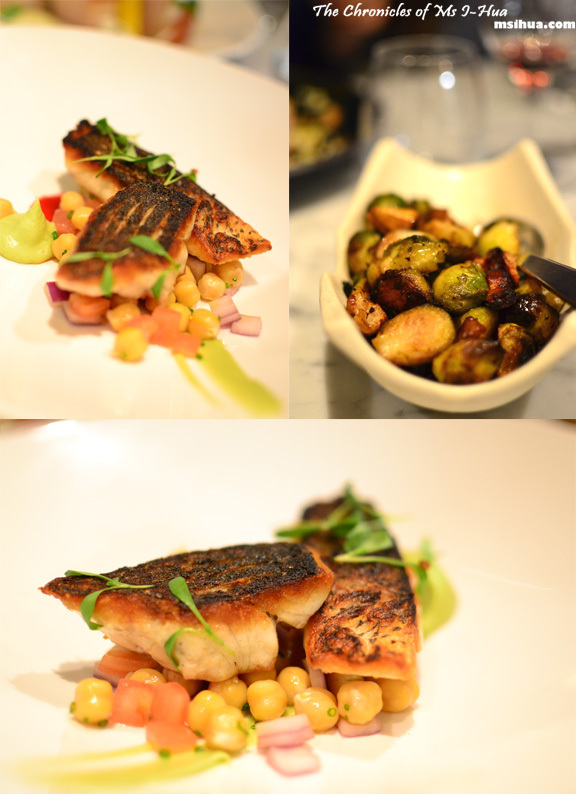 As this was only a snapshot of what the kitchen does, I can’t wait to go back to try out more of their menu! Question – food bloggers being food bloggers … is any of the food still warm after all the photographing and portioning that’s done at these events? I mean, it’s great for those of us who get to read and drool but do you actually get to enjoy the food at its peak? Oh wow…I didn’t know Paul is also the owner of The Sharing House and Akachocin! WOW so many in just 6 months! I remember seeing your photos on Instagram and drooling! Oh let me know how the breakfast goes! I might head in one morning too! 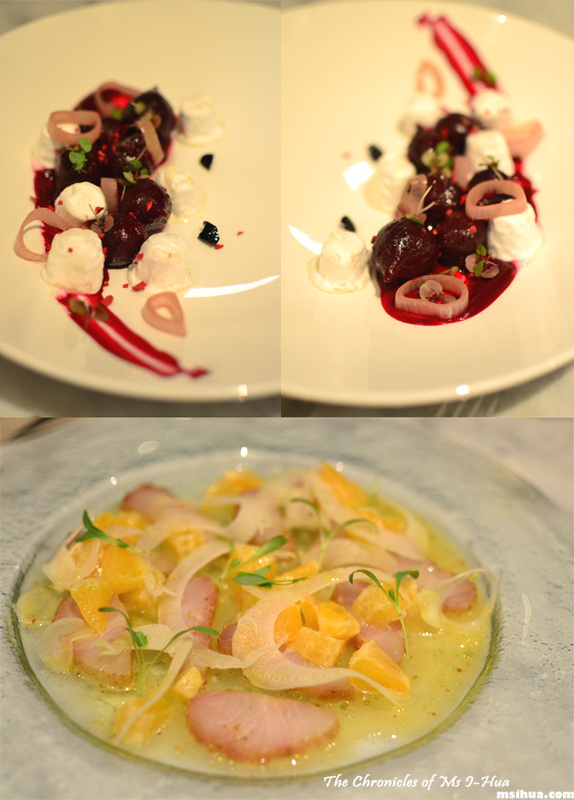 Definitely love the look of the entrees and looks like the passionfruit dessert is something to try if I get over there! You must try the passionfruit if that’s the only thing you order there!